Despite a long research effort, finding the minimum area for straight-line grid drawings of planar graphs is still an elusive goal. 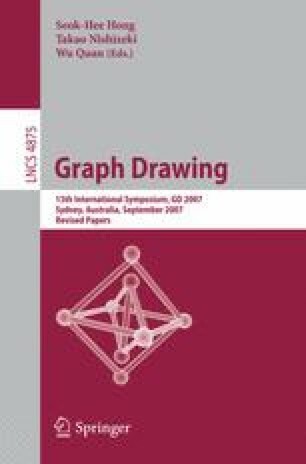 A long-standing lower bound on the area requirement for straight-line drawings of plane graphs was established in 1984 by Dolev, Leighton, and Trickey, who exhibited a family of graphs, known as nested triangles graphs, for which (2n/3 − 1) ×(2n/3 − 1) area is necessary. We show that nested triangles graphs can be drawn in 2n 2/9 + O(n) area when the outer face is not given, improving a previous n 2/3 area upper bound. Further, we show that n 2/9 + Ω(n) area is necessary for any planar straight-line drawing of a nested triangles graph. Finally, we deepen our insight into the 4/9n 2 − 4/3n + 1 lower bound by Dolev, Leighton, and Trickey, which is conjectured to be tight, showing a family of plane graphs requiring more area. Work partially supported by EC - Fet Project DELIS - Contract no 001907 and by MUR under Project “MAINSTREAM: Algoritmi per strutture informative di grandi dimensioni e data streams”.